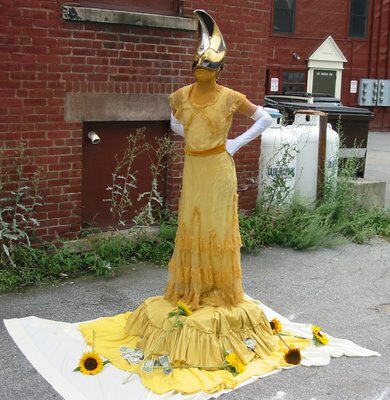 It's been a few weeks since I posted about the performance artist at the Montpelier farmer's market. Betwwen being away during the weekend and forgetting my camera, I haven't had any photos to post. However, I had my camera on me today and snapped this photo. In comparison to the outfits in early July, this costume is downright regal. Unfortunately, for them, a Black River Produce truck parked in front of them for a while which hid her from the crowd. I had been wondering how the person entered and exited the market and whether they stayed in character or not. Well, a week or two ago, I happened to be there when they were leaving. They stayed in character and walked away from the market at a snail's pace; much like they are at the market. I didn't follow them down the street but they headed down State St. towards Main St. I'm guessing they went into one of the buildings along State St. and changed. After the market, my daughter and I went over to the used instrument sale at Bethany Church that jds at Lat 44.2N had posted about yesterday. It similar to the ski and skate swap the Montpelier Recreation Dept. runs in the fall. People drop off instruments they want to sell and a portion of the sale goes towards Central Vermont Share the Music to raise money for music scholarships. 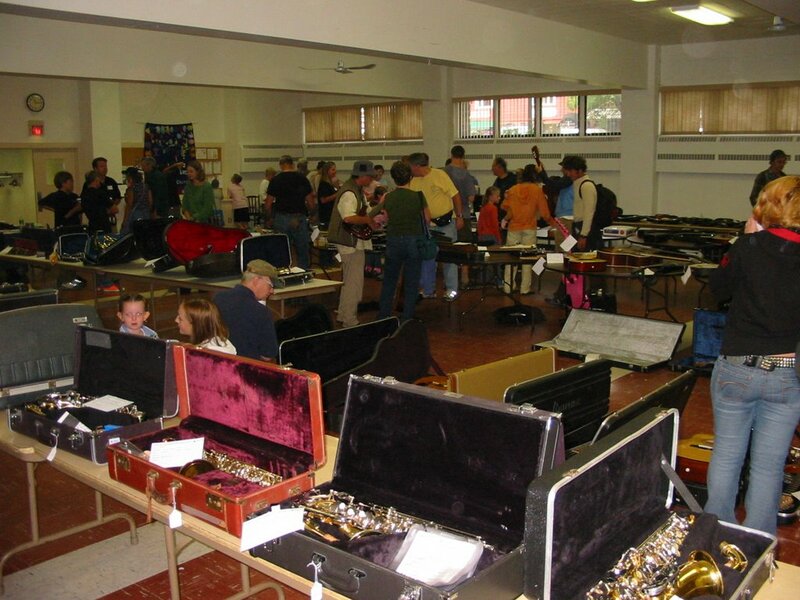 It isn't as big as the ski and skate swap but there were a lot of instruments there and lots of buyers. I flirted with the idea of picking up a small accordian to mess around with but I have zero musical ability. So, I just picked up the free music sampler disc from Lost Highway Records that were being given away. Listening to music is more of my thing.